Welcome to the first day of spring, Melbournians! It still felt pretty wintry to me today, but it's definitely starting to warm up. And the sun was shining today! 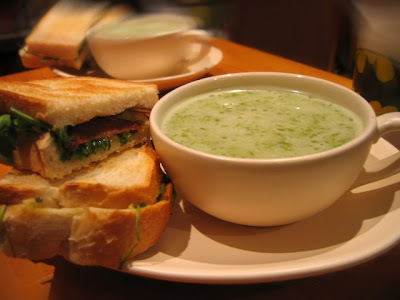 This supper of pea and pesto soup with a bacon sarnie, from a few weeks back now, is well suited to our Melbournian springtime weather. It's warm and comforting enough to get you through a cold couch-bound Dexter-watching night, but not so heavy as to leave you in a potato-gravy stupor. As a bonus, pretty much all the ingredients are store-cupboard staples for me. Wahoo! Frozen peas, spring onions, pesto and stock cubes for the soup, and for the sandwich: white bread, cheese, bacon (also frozen) and whatever not-yet-liquid lettuce I could scrounge from my fridge. The pea and pesto soup comes from Nigella Express, and tastes as good as you'd expect it to, although with my blender the whole process is a bit of a mess. I can never get a smoothly puréed soup happening these days; it's possibly time to upgrade my blender. The bacon sarnie was my own addition. My only advice for bacon-sandwich makers is to grill the bacon separately before putting it between the bread, and then toasting the whole sandwich for maximum crunchification. In future I'd team the soup with a sandwich made from wholemeal or multigrain bread, for a healthier, more substantial supper.